Stromatolites or stromatoliths are defined (Riding 2007) as layered accretionary structures formed in shallow water by the trapping, binding and cementation of sedimentary grains by layers of microorganisms, especially cyanobacteria (commonly known as blue-green algae). Stromatolites provide some of the most ancient records of life on Earth. The layers of fossil stromatolites were produced as calcium carbonate precipitated over the growing mat of blue-green algal filaments; photosynthesis in the cyanophytes depleted carbon dioxide in the surrounding water, initiating the precipitation. The minerals, along with grains of sediment precipitating from the water, were then trapped within the sticky layer of mucilage that surrounds the blue-green algal colonies, which then continued to grow upwards through the sediment to form a new layer. As this process occured over and over again, the layers of sediment were created. In some cases, the stromatolites were infiltrated with a mineral-rich solution which fossilized the blue-green algaealong with the layers, but more often only the layers are preserved. The oldest stromatolites date to the Early Archaean, about 3 billion years ago, and became abundant by the end of the Archaean. 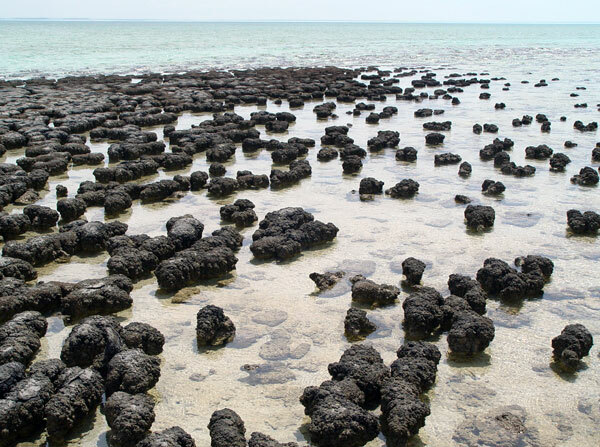 In the Proterozoic, beginning about 2.5 billion years ago, stromatolites were widespread on earth, and were ecologically important as the first reefs. By the close of the Proterozoic, the abundance of stromatolites decreased markedly, though cyanobacteria continued to leave a fossil record, such as Langiella and Kidstoniella known from the Lower Devonian Rhynie chert. The cyanobacteria have also been tremendously important in shaping the course of evolution and ecological change throughout earth's history. The oxygen atmosphere that we depend on was generated by numerous cyanobacteria photosynthesizing during the Archaean and Proterozoic Era. Before that time, the atmosphere had a very different chemistry, unsuitable for life as we know it today. Photo: Shark Bay, Western Australia, Paul Harrison (Reading, UK). Truly remarkable stomatolites in hypersaline environments in Shark Bay in Western Australia (above; a UNESCO World Heritage site), and hyper-dry and cold environments in the Antarctic Dry Valley Lakes. Parker, B.C., Simmons, G.M. Jr., Seaburg, K.G., Cathey, D.D. and Allnutt, F.C.T. (1981). Modern stromatolites in Antarctic Dry Valley lakes. Bioscience 31(9): 656-661. Site © M.D. Guiry 2000 - 2019. Important copyright notice: all text, design and photographs on this site are copyrighted by M.D. Guiry unless otherwise stated and all rights are strictly reserved. Click here for copyright information and contact. Website design: 249 Design Studio. Site maintained by M.D. Guiry (michael.guiry@nuigalway.ie). There have been 8724820 page loads since 1 January 2014 on 22 April 2019.